When people suffer a personal injury due to the negligent acts of others, the attorneys at Black, Lyle & Habberfield, LLP, provide dedicated legal counsel. Licensed to practice in New York and Pennsylvania, we serve residents of both states in their injury claims. Specifically we serve clients in Allegany, Cattaraugus, Chautauqua, Erie, Genesee, Monroe, Niagara, Steuben and Wyoming counties, and throughout Western New York, including in Alfred, Bath, Buffalo, Cuba, Fredonia, Hornell, Jamestown, Olean and Wellsville. We also accept cases on behalf of clients throughout McKean, Potter and Warren County as well as all of western Pennsylvania, including Pittsburg and Erie. For over 50 years, our law firm has assisted clients with a range of personal injury cases, including motor vehicle accidents, nursing home abuse and neglect, trucking injuries, slips and falls, dog bites, medical malpractice and construction injuries. We recognize that each person’s circumstances, injuries and needs are unique, which is why we customize our approach based on their situations. Our attorneys protect our clients' interests throughout every step of the legal process. Identifying and understanding the factors that may have contributed to an incident or injury can be a challenge. Understanding this, we have an investigator and registered nurses as well as a large staff of paralegals all with extensive experience handling personal injury claims. During a free initial consultation and throughout the process, we work with our clients to comprehend the extent of their injuries, as well as their effects. It is our goal to help those we represent to achieve the maximum compensation for their losses. We also strive to explain the process each step of the way so our clients are informed. In addition to aiding clients with personal injury claims, the attorneys at the law firm of Black, Lyle & Habberfield, LLP, also handle wrongful death cases on behalf of families who have lost a loved one due to another’s negligent or reckless actions. No one deserves to be injured as a result of negligence but, if someone is injured they do deserve competent legal counsel and to be treated with respect. 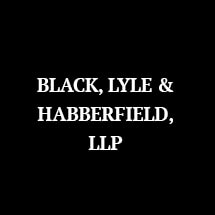 The attorneys at Black, Lyle & Habberfield, LLP will provide this to all of their clients.